Fresh drinking water is a guarantee with the Evolve 30-Day Filter from Aqua Optima. The Evolve Filter has a fast flow filter cartridge and a unique one of a kind 5 step filtration system. The Evolve 30-day Filter is compatible with Aqua Optima and Brita Maxtra. 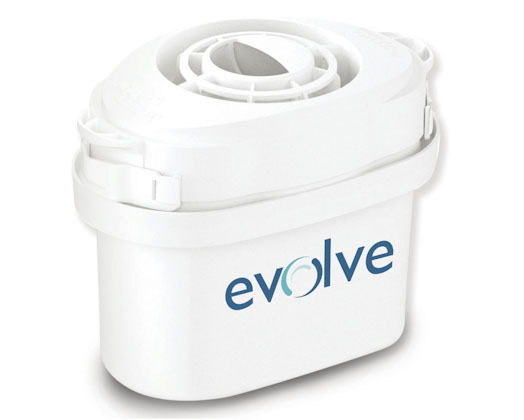 The Evolve 30-Day filter has a single life 30 day filter lifespan. 1. fine particle filter removes sediments. 2. activated carbon reduces levels of herbicides, pesticides and chlorine. 3. special ion exchange resin reduces levels of heavy metals and helps prevent limescale. 4. ultrafine mesh helps to give extra clarity to your filtered water. 5. unique shape and structure ensures a consistent, fast flow rate. Compatible with aqua optima and brita maxtra. Single life 30 day filter.